Inorganic Reactions and Methods systemizes the discipline of modern inorganic chemistry according to a plan constructed by a council of editorial advisors and consults that include three Nobel laureates (E.O. Fischer, H. Taube, and G. Wilkinson). Rather than producing a collection of unrelated review articles, this series creates a framework that reflects the creative potential of this scientific discipline. In a clear, concise, and highly organized manner, it provides an in-depth treatment of bond formation reactions categorized by element type. The series covers all areas of inorganic chemistry including chemistry of the elements, coordination compounds, donor-acceptor adducts, organometallic, polymer and solid-state material, and compounds relevant to bioinorganic chemistry. A unique index system provides users with several fast options for accessing information on forming any bond type, compound, or reaction. Coverage of both classical chemistry and the frontiers of today's research make this series a valuable reference for years to come. 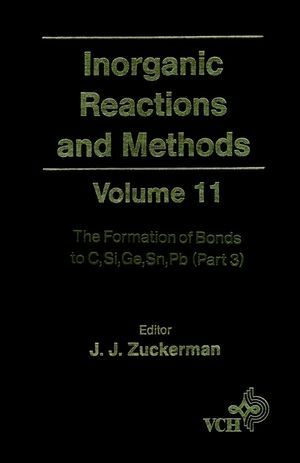 J. J. Zuckerman is the editor of Inorganic Reactions and Methods, Volume 11, The Formation of Bonds to C, Si, Ge, Sn, Pb - Part 3 - , published by Wiley. A. P. Hagen is the editor of Inorganic Reactions and Methods, Volume 11, The Formation of Bonds to C, Si, Ge, Sn, Pb - Part 3 - , published by Wiley.